Following the success of the 4th edition held at the Palazzo Italia in Berlin on October 2016, we're now organising the 5th edition and are calling professional and amateur photographers from all over the world to submit their work for consideration of the Biennial Curators' Committee. The last edition showcased 1,200 photographs of 420 artists and had Steve McCurry as an special invitee exhibiting a retrospective of his works. 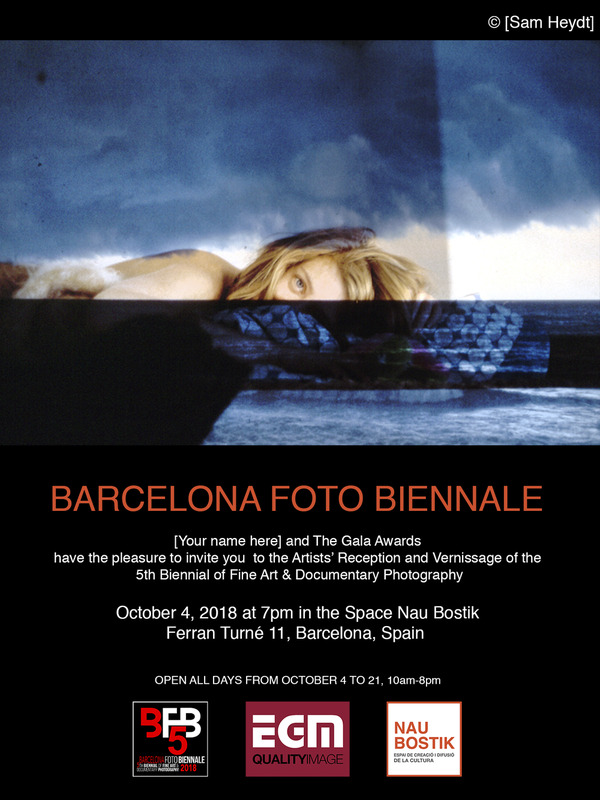 This 5th edition will be held in Barcelona in October 2018 exhibiting works selected from the 10th and 11th Julia Margaret Cameron Award, the 9th, 10th and 11th Pollux Awards, and other Awards hosted by The Photography Gala Awards. 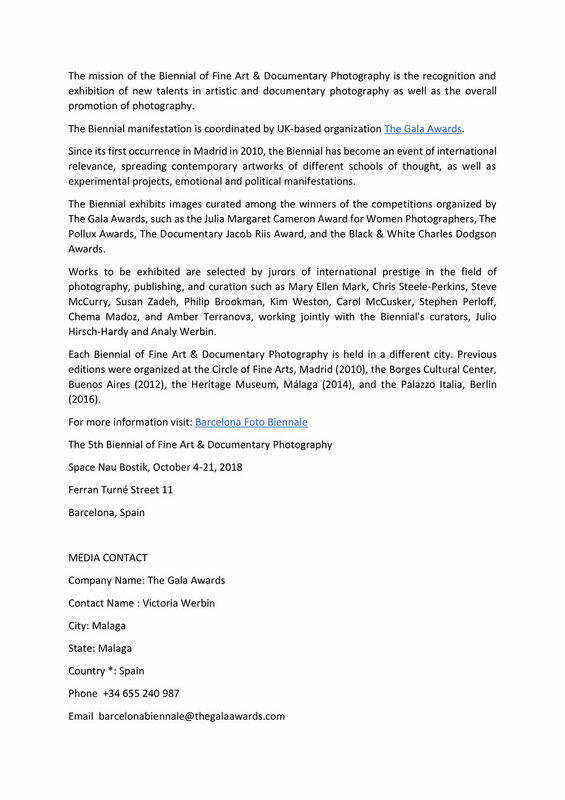 With this call, free to enter, we want to expand the scope of this unique event giving an opportunity to photographers worldwide to exhibit their work in a multicultural city such as Barcelona. The Biennial will take place in several galleries in Barcelona, during the month of October 2018, with a central hub in the Gallery Valid Foto. Final venues will be announced shortly. The Biennial is also working in the feasibility of doing night projections of all works exhibited, in large screen in a public square in Barcelona during the Barcelona Gallery Week End on September 26-29. October 4 at 7PM. Free entry. Meeting Point: Catedral Square; ending at the Biennial's venue. Fees include meals (lunch) and transportation, as well as a bilingual guide. Two Reviewers will be assigned to each participant, based on first in first served, and reviews will be one after the other (40 minutes in total). Participants should ideally bring printed material, or if prints are not available iPad or Laptop. Reviews will be open to the public. To register please fill out the Portfolio Review Registration Form. All Conferences are in English, include photography projections and are free to attend; open to all public. Theme: Is photography booming while dying as an artform? Location: Hall Roman Polanik, Space Nau Bostik; free entry.